Tailings are the waste product that results from mining, crushing, grinding and chemically treating ore. The tailings storage facilities (TSF) also known as processed ore containment facilities consist of crushed rock, water, and chemicals. In the long term the tailing facilities become part of the topographic form. An important function of these tailings facilities is to prevent the uncontrolled release of material into the environment during operation and closure. These facilities are often set up as settling ponds and dams lined and later capped with a geomembrane or textile. 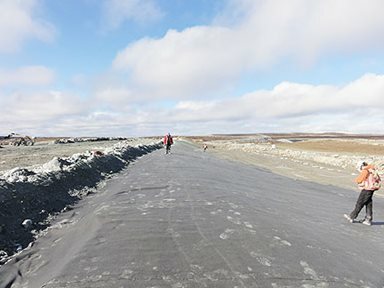 In many tailings ponds a flexible prefabricated geomembrane such as Enviro Liner® 6000HD provides many cost and performance advantages. These advantages include improved seam integrity and the ability to elongate axi-symmetrically. Enviro Liner® 6000HD is recommended in 30 to 80 mil thicknesses to line tailings ponds and dams due to its very advanced and stabilized UV antioxidant package providing it unparalleled long-term resistance to exposure to the sunlight. Our Enviro Liner® 4000 in 30 and 40 mil thicknesses is recommended with a soil cover over the liner. Layfield also offers many key geosynthetic products used during construction, operation and remediation of the tailings facilities. Some of these products include soil stabilization materials such as geotextiles and grids, remediation liners, dewatering systems and erosion control products.